US President Donald Trump says the US will ‘get angry’ if Syrian government slaughters civilians in rebel-held Idlib province; Trump denies claims published in new tell-all book that he wanted to assassinate Syrian President Bashar Assad. US President Trump warned Syria on Wednesday not to “slaughter” millions of innocent civilians trapped by government forces in the country’s last major rebel-held enclave, while denying claims in a new tell-all book that he wanted to assassinate Syrian President Bashar Assad last year in the wake of a suspected chemical attack on rebel groups. Trump addressed the situation in Syria’s rebel-held Idlib province during a White House meeting with the emir of Kuwait. “Slaughter cannot occur,” Trump said in reference to the crisis in Idlib, where rebel forces and millions of Syrian civilians have taken refuge following a major government advance this year. Trump warned that “If it’s a slaughter” the US and the entire world are “going to get very, very angry.” The American president’s fresh warning followed a White House promise to respond “swiftly and appropriately” to an expected offensive by President of Syria Bashar Assad against some 3 million civilians in the opposition stronghold. But the offensive is already underway: The Russian Defense Ministry said Wednesday that four of its jets bombed a weapons depot and launch pad for drones used by an al Qaeda offshoot based in Idlib. Moscow accuses the militants of deploying the drones to target Russian military bases in Syria. 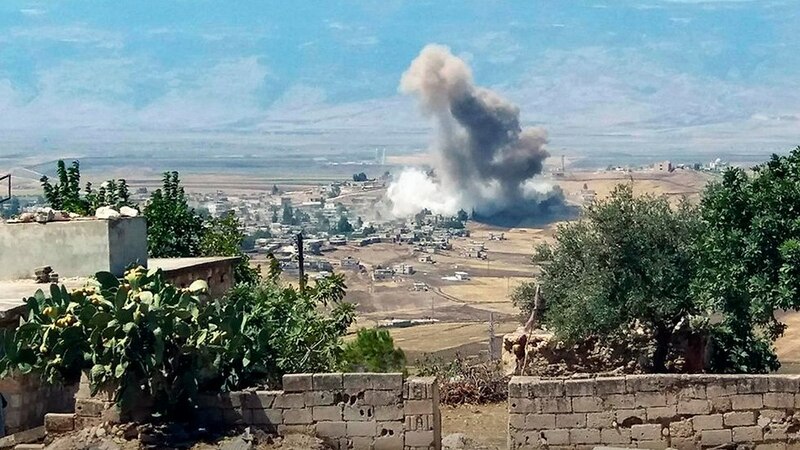 The Russian Defense Ministry noted that the airstrike targeted jihadists alone and that Russia did not attack residential areas, but according to a Syrian report, 13 civilians, including six children, were killed in the bombing. 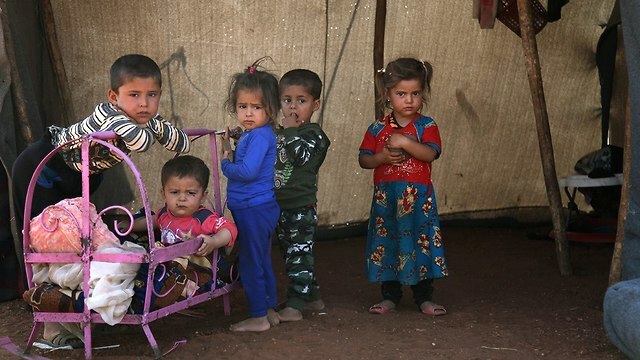 The US president’s comments came as the 10 non-permanent members of the UN Security Council issued a joint statement Wednesday urging a peaceful solution in Idlib, where a major Syrian military offensive with Russian and Iranian backing has been building for months. The US ambassador to the United Nations, Nikki R. Haley also said she’ll chair a Security Council meeting Friday on the Idlib crisis, asserting that the Assad “regime and its backers must stop their military campaign in all its forms” and allow UN.-led political negotiations over Syria to proceed. Moscow claimed that four of its jets struck targets linked to an al-Qaida-linked group, including a weapons depot and a launch pad for drones that Russia says have targeted its military bases in Syria. The Russian military says it has shot down dozens of hostile drones. The Russian planes took off from the Russian air base near Latakia, and resumed its attacks on the province following a 22-day truce. 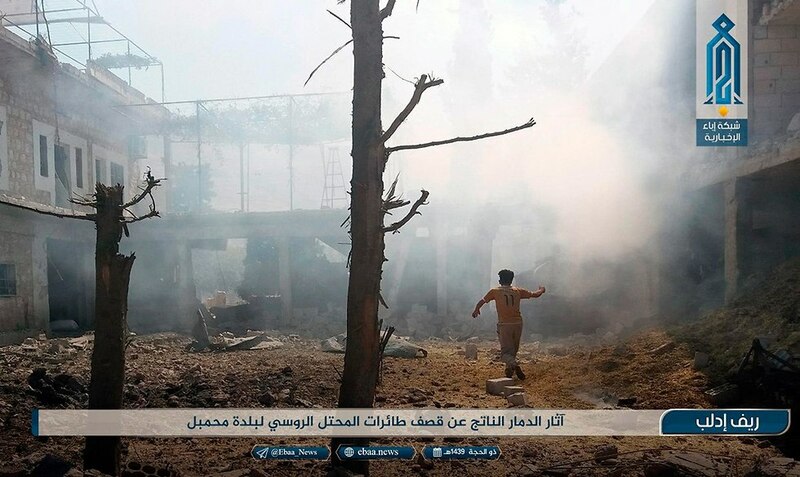 The Syrian regime is also bombing rebels in the northern Syrian province. Trump also denied claims that he had ordered the assassination of Syrian President Bashar Assad following a chemical attack by the Syrian army, as reported by famed Watergate reporter Bob Woodward in his the new book. 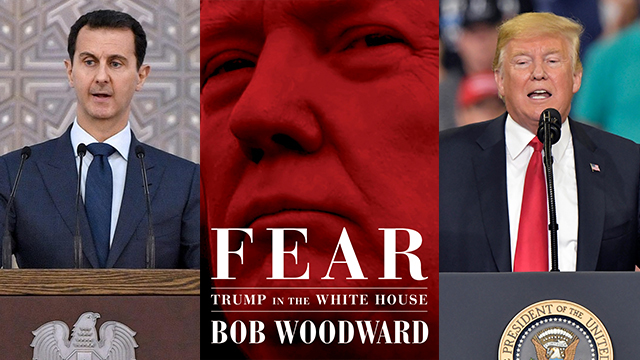 The book, titled “Fear: Trump in the White House,” is the latest to detail tensions within the White House under Trump’s 20-month-old presidency. It portrays the US president as prone to profane outbursts and impulsive decision-making, painting a picture of chaos that Woodward says amounts to an “administrative coup d’etat” and a “nervous breakdown” of the executive branch. According to the book, on April 4, 2017, an upset Trump phoned US Defense Secretary Jim Mattis after photos showed a sarin gas attack on Syrian rebels. Women and children were among dozens killed and photographed. The attack was blamed on Syrian President Assad. “Let’s f—ing kill him!” Trump said. Woodward quotes Mattis as telling the president he would get right on that. Haley, the US ambassador to the UN, cast doubt on the account about Assad. “I have the pleasure of being privy to those conversations … and I have not once heard the president talk about assassinating Assad,” Haley told reporters on Tuesday. Once upon a time diplomacy kept the balance between Israel and the Palestinians, but times have changed. In the Yom Kippur War of 1973, Kissinger brought the world back from the brink of nuclear war. Once Israeli forces had recovered from the surprise Arab invasion and started advancing on Cairo and Damascus, the Soviet Union threatened to intervene militarily, even with nukes. Some historians say it was the closest the world has ever come to an actual thermonuclear exchange. Alarmed, Kissinger rushed to resolve the deepening crisis. Shuttling between the various capitals, Kissinger managed to halt the IDF advance on Cairo at Kilometer 101 and 20 miles short of Damascus. His intervention positioned Washington as the primary mediator between Israel and the Arabs going forward. Kissinger’s model for Middle East diplomacy was built on the premise that America is the only country that can bring Israel to heel, and thus the Arabs were wise to accept Washington as the main broker of peace between them. Largely a product of the Cold War, this approach strengthened the West’s relations with the Arab world and ensured the free flow of Mideast oil to thirsty global markets for decades to come. Yet it required that the US (and its allies) adopt an even-handed approach to the Arab-Israeli conflict. This eventually meant that Israel’s historic rights and claims to its ancient homeland had to be put on a par with the much more novel Palestinian nationalist claims. This contrived ‘neutrality’ required that everything had to be balanced. So for every condemnation of Palestinian terrorism or incitement, there had to be an equal denunciation of Israeli settlements. Every foreign leader who visited Jerusalem and laid a traditional wreath at Yad Vashem was also obliged to visit Ramallah and lay a wreath at Yasser Arafat’s grave. Today, however, the Kissinger paradigm is collapsing. We saw this evidenced already when Indian Prime Minister Narendra Modi paid a historic visit to Israel and Jerusalem in summer 2017 and very pointedly skipped Ramallah and the Palestinian Authority. – Supported the Taylor Force Act, which freezes US funding to the Palestinians so long as their “pay-to-slay” policy continues. Some are hoping Trump will also recognize Israeli sovereignty on the Golan or Israel’s annexation of parts of Judea/Samaria. The current move away from the Kissinger model is due to a unique combination of Trump’s unconventional approach to diplomacy, certain regional shifts caused by the Arab Spring and the growing threat of Iranian hegemony. The ancient Sunni-Shi’ite rivalry has flared, especially in Syria, and Trump has sided with the Sunni Arab powers, whose interests in containing Iran mesh well with Israel’s interests. Israel also has managed to establish a cooperative relationship with Russia without undermining its close ties to Washington. The overall shift is so discernible that even Saudi officials are warning that unless the Palestinians learn to compromise, history is about to pass them by. David R. Parsons is an author, attorney, journalist, ordained minister and Middle East specialist who serves as vice president and senior spokesman for the International Christian Embassy Jerusalem. 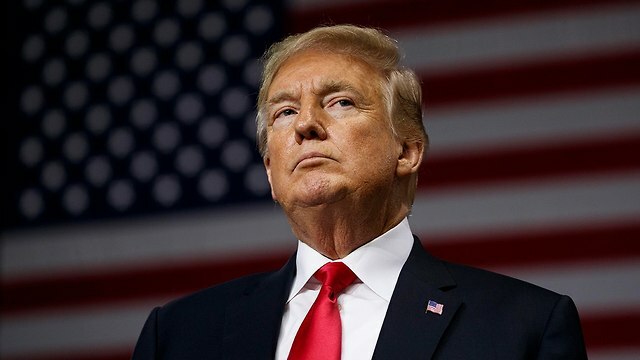 WASHINGTON (TNS) — President Donald Trump said Iran’s future as a country is in doubt amid public discontent with the Islamic Republic. The president spoke during a meeting with Kuwait’s emir, Sheikh Sabah al-Ahmed al-Sabah, echoing comments in a Bloomberg interview last week saying the Iranian regime may collapse because of his administration’s policies. Trump — encouraged by Iran’s regional foes — pulled the US from the 2015 international nuclear accord in May, accusing the Islamic Republic of threatening Middle East security as it expands its regional influence. He reimposed sanctions on Iran in August, with Iran’s vital oil industry due to face penalties beginning in November. Inflation in Iran has surged and its currency weakened, placing added pressure on President Hassan Rouhani as he tries to navigate through the crisis. The construction of the barrier, which began several months ago by the Northern Command, is led by the 91st Regional Division and is expected to cost 1.7 billion NIS. As the IDF continues to strengthen Israel’s northern border by completing 11 kilometers of a concrete barrier along the Lebanese border, a senior officer in the Northern Command has warned any Hezbollah militant who infiltrates into Israel will be killed. The border fence with Lebanon was originally built in the 1980s and while sections of it have been upgraded several times it is said to be in poor condition. According to a senior officer, the Northern Command would not stop an infiltration by Hezbollah’s elite Radwan unit who in the next war, is expected to attempt to capture an Israeli community or military outpost. Due to the threat of infiltrations by Hezbollah, 22 Israeli communities along the border with Lebanon will be evacuated. “We would want to carry out the evacuations as soon as possible. It will take several days and will not be simple,” he said. Israel has never carried out a mandatory evacuation of any community since the founding of the state but in addition to the threat posed by Hezbollah rocket barrage, the IDF is now concerned about the very real possibility of ground attacks by the terror group’s Radwan unit against Israeli civilian communities in border communities. Israel began construction on a new barrier along the border with Lebanon several months ago and is expected to cost 1.7 billion NIS. Currently under construction in the areas of the Sulam Ridge, Metula and Misgav Am to the south and east of the Blue Line by the engineering forces of the Northern Command and the 91rst Division together with the “Gvulot VeTefar” administration, is expected to be completed in the coming months. The project takes place entirely in Israeli territory, and is fully coordinated with UNIFIL. Similar to the “smart fence” which runs along Israel’s border with Gaza and Egypt and some 30 kilometers along the border with Jordan, the concrete, steel and barbed wire fence will be nine-meters high stretching for several kilometers, with sensors, cameras, information collection centers and warning systems. The cameras along the fence are connected to a war room to alert troops to any possible infiltration. It will also have lifting devices for the safe and secure maintenance of the cameras to prevent any possible firing towards IDF troops. According to the IDF, Israel’s intelligence capabilities has increased dramatically since the Second Lebanon War in 2006 and has five times the number of targets in the north if another war were to break out. The IDF has carried out several large-scale drills simulating war with the Lebanese terror group in the past year, including one by the Paratroopers brigade which finished on Thursday, the fourth combined brigade exercise that took place in the past month as part of the IDF’s training exercises to improving the preparedness of troops. IDF Chief of Staff Lt.-Gen. Gadi Eisenkot told members of the security cabinet and the Knesset Foreign Affairs and Defense Committee this week that the military is ready for war under any scenario. In the Security Council, American president plans “to divert session to blame Iran for horrors the U.S. and others have unleashed across the Middle East,” Mohammad Javad Zarif says • He also accuses Trump of “bullying” world powers into sanctioning Iran. Iranian Foreign Minister Mohammad Javad Zarif accused U.S. President Donald Trump on Wednesday of planning to “abuse” the presidency of the U.N. Security Council to criticize Tehran, Washington’s archfoe. “There’s only one UNSC [U.N. Security Council] resolution on Iran. .@realDonaldTrump is violating it & bullying others to do same. Now he plans to abuse presidency of SC [Security Council] to divert a session—item devoted to Palestine for 70 yrs— to blame Iran for horrors US & clients have unleashed across M.E. [Middle East] #chutzpah,” Zarif wrote in a tweet. U.S. Ambassador to the United Nations Nikki Haley said on Tuesday that Trump would chair a U.N. Security Council meeting on Iran this month to highlight its “violations of international law” during the annual gathering of world leaders in New York. Trump in May withdrew from Iran’s nuclear agreement with world powers which is aimed at stalling Tehran’s nuclear capabilities in return for lifting some sanctions and ordered the reimposition of U.S. sanctions suspended under the deal. European powers have been scrambling to salvage the accord, but the spokesman for Iran’s Atomic Energy Organization said Tehran would relaunch its nuclear programme at a higher level than previously if the nuclear agreement collapsed. “We are far more advanced than at the time of agreeing to the nuclear deal,” spokesman Behrouz Kamalvandi was quoted as saying by the state-linked media corporation Islamic Republic of Iran Broadcasting. In Washington, Trump said on Wednesday he remained open to the possibility of talks between Washington and Tehran but said Iran was in turmoil and struggling to survive. Abdulrahman Al-Rashed is the former general manager of Al-Arabiya television. He is also the former editor-in-chief of Asharq Al-Awsat, and the leading Arabic weekly magazine Al-Majalla. He is also a senior columnist in the daily newspapers Al-Madina and Al-Bilad. I suspect that had the parliamentary elections in Iraq been held last year, Iran would have easily imposed its choices for prime minister and the government. Fortunately for the Iraqis, however, things have developed, internally and externally, against the wishes of Gen. Qassem Soleimani, who regards himself the governor of the Fertile Crescent. Moreover, the Americans and their important allies have been active this year, dealing with the elections as a serious matter that needs to be monitored to counterbalance the Iranian pressure. The Israelis also have entered the game in their own way, threatening to bomb Iran’s military presence in Iraq regardless of the consequences. In any case, it seems that the elected Iraqi MPs who are willing to stand against the ambitions of the Iranian regime now form the majority in the Iraqi parliament. More than 171 MPs have joined the Sairoun moderate parliamentary bloc, led by Shiite cleric Moqtada al-Sadr, making it bigger than the “Iran-affiliated” bloc led by Nouri al-Maliki and Hadi al-Ameri. It is natural, therefore, for Tehran to be shocked by the developments. It had considered Iraq a more secure “client state” than Syria and Lebanon, but now it can see its political, security and military investment evaporating before its eyes. We should not forget, either, that Iran credits itself with liberating Mosul from ISIS and saving Baghdad from collapse at the time. Not surprisingly, Sky News Arabia reported yesterday that some Iraqi deputies have received death threats from the Iranians if they support the Sairoun bloc. Thus, it is enough to read the statements and news from Iranian institutions to recognize the extent of the anger in Khamenei’s court. All of its reactions portray the rise of Sairoun as an American conspiracy and refuse to respect the choices of the people’s representatives. As for Israel, it is clear that its statements are threats aimed at Iran and at any future Iraqi government that might think of bowing to Tehran’s demands. Israel has warned the next Iraqi government that hosting Iranian missile batteries “fleeing” from Syria into Iraq will invite attacks by Israeli fighter-bombers, which will not be deterred by the issue of sovereignty from seeking out and bombing these weapons. Is Israel serious in its threat? Is it aware that Iraq, unlike Syria, is an independent, stable state? Israeli Defense Minister Avigdor Lieberman, talking about the possibility of bombing the Iranian Revolutionary Guards in Iraq, hinted that “we are not limiting ourselves to Syrian territory. That should be clear.” The same threat was reiterated by the deputy chief of the general staff of the Israel Defense Forces. It is clear to everyone that Iraqis are deciding the future of their country and the future of their children, not just the choice of government and premiership. The rise of any pro-Iranian group would make this great country, which has suffered so much, an easy target for a system that is living through its darkest days. The regime in Tehran intends to use Iraq as a “confrontation state,” in other words a sandbag to hide behind on the line of fire against the US and its allies. It also wants Iraq to launder Iran’s dollars and buy its goods with the Iranian rial. Furthermore, the Iranian regime wants to use Iraq to smuggle goods, break the sanctions imposed on it, and use its water to alleviate the crisis being experienced by the residents of the Iranian countryside because of the regime’s bad development policies and its waste of Iran’s savings in the wars in Lebanon, Syria and Yemen. Indeed, the Tehran regime wants to turn Iraq into another Lebanon, in which its militias, such as the Iraqi Hezbollah, are active and fight on its behalf, just like the Houthis in Yemen. Everybody is now waiting for the Iraqis’ crucial decision, which will mean much not only to their own country, but to the entire region. The Russian defense ministry confirmed Wednesday that its fighter jets bombed the Idlib province on Tuesday, after the Syrian Observatory for Human Rights had said Tuesday Moscow had resumed air strikes on Syria’s last rebel-held stronghold after a 22-day break. The defense ministry stressed that the strikes targeted merely rebel Jihadists and that Russia had refrained from attacking residential areas. However, according to a Syrian report, 13 civilians were killed in the strikes, with six of them being children. The Russian foreign ministry said on Wednesday that it was Russia’s duty to fight terrorists in Syria’s Idlib until their “complete and final liquidation”, and called on other countries to support that effort, not obstruct it. In a statement, the ministry said its actions in Idlib province were in line with multilateral agreements aimed at stamping out violent militant groups. “Russia considers it its duty to closely follow these agreements and will continue to destroy terrorists until their final and complete liquidation,” the ministry said in the statement. Russia claims that four of its aircraft equipped with high precision-guided arms, struck Tahrir al-Sham (al-Qaeda-affiliated organization) targets. 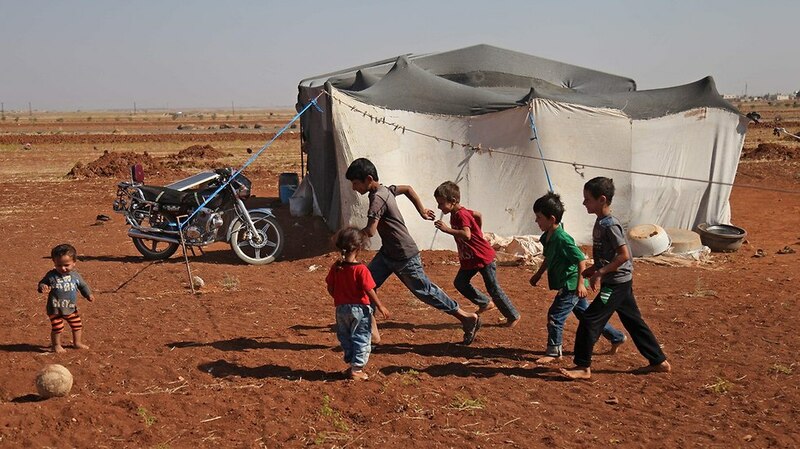 The Syrian regime is also bombarding the rebel-held province. In recent weeks, President Basahr Assad’s forces are approaching Idlib, planning an attack that could end the seven-year civil war. Meanwhile, Russia is currently conducting a vast military exercise in the Mediterranean Sea, which is expected to reach its highest point of intensity on Wednesday at 6 am until Thursday at 1 pm and is scheduled to end on Saturday. The world is concerned a humanitarian disaster might occur. However, the Kremlin says that the drill aims to prepare for scenarios in which Russia may be forced to face with the US-led coalition operating in Syria. Russian Deputy Foreign Minister Sergei Rybakov said that so far all of Russia’s military actions in Syria were executed with high precision to avoid harming civilians as much as possible. “We, as we have said many times before, act precisely, selectively, trying to minimize possible risks to the peaceful population,” Ryabkov as explained. Turkish President Tayyip Erdogan warned Wednesday that an attack on Syria’s Idlib—which borders with Turkey— would be a massacre and voiced concern that hundreds of refugees would flee to Turkey. “The situation in Idlib is crucial for Turkey. A ruthless process has been going on there. … God forbid, if this area is hailed by missiles there would be a serious massacre,” Erdogan opined. 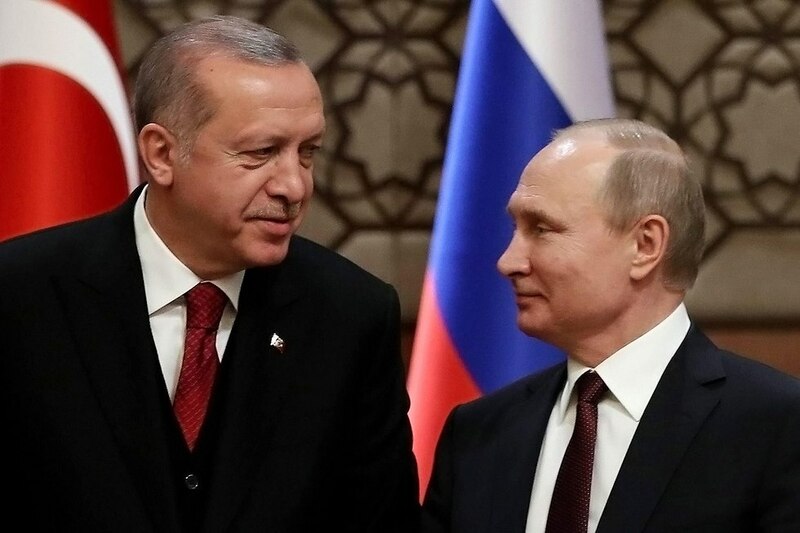 Turkey, that support some of Syria’s rebel groups, held several talks with Russian and American officials in an attempt to prevent Assad’s planned phased offensive to reclaim Idlib. “Three and a half million people live there. In case of a disaster, God forbid, they will flee to Turkey,” Erdogan went on to say. Turkey, Russia and Iran’s leaders will attend a three-way summit in Tehran on Sept. 7, which will address the civil war in Syria which is nearing to its end. The UN Security Council is expected to convene Friday to discuss Idlib’s situation, while taking into account the possibility Assad will use chemical weapons to reclaim the rebel-held province, causing a humanitarian disaster.Kremlin spokesman Dmitry Peskov said Russia would continue to fight against groups it sees as terrorists in Syria and that Idlib was a “nest of terrorism”. UN envoy to Syria, Staffan de Mistura expressed fears of a “perfect storm” that could have a devastating impact on nearly 3 million people— nearly half of whom arrived from elsewhere in Syria—in the region largely controlled by al-Qaida-linked fighters. US President Donald Trump on Monday warned Syrian President Bashar Assad and his allies Iran and Russia not to “recklessly attack” Syria’s rebel-held Idlib province, warning that hundreds of thousands of people could be killed. “The Russians and Iranians would be making a grave humanitarian mistake to take part in this potential human tragedy. Hundreds of thousands of people could be killed. Don’t let that happen!” Trump wrote in a tweet. The UN and other human rights organizations have warned that a military operation in Syria might cause one of the biggest humanitarian catastrophes Syria had known during its seven-year civil war. Tahrir al-Sham’s jihadists currently control more than half of Idlib. The rest of the province’s territory is mainly dominated by rebels supported by Turkey. Assad’s regime took the reins over the small southeast part of the province. The Syrian army bombarded Idlib today, while the rebels blew up another bridge in an attempt to thwart the upcoming attack.